In my previous post, I said that the way to eliminate “careless mistakes” when you’re doing math is to stop thinking of them as careless. The issue isn’t carelessness, it’s focus. What’s really happens is that you lose your focus for a moment. That’s good news, because focus is a lot easier to correct than “carelessness”. So what is focus, anyway? For our purposes, we could say that focus is placing your full attention exactly where it needs to be at any given moment. If you’re driving, ideally your attention should be on the cars around you. If you look down at your radio for a moment, placing your attention there instead, and at that same moment the car in front of you stops short, you might hit him. If you weren’t looking down, it wouldn’t happen. That’s losing your focus. It’s having your attention on the wrong thing. When you’re driving, it can cause an accident. When you’re doing math, it can cause you to get a problem wrong when you know how to get it right. In order to answer any math problem correctly, you have to do 3 things. You have to read the problem correctly. You have to figure out how to solve it. You have to do the calculation correctly. Reading the problem correctly means that you have to know what they’re asking you to solve for, and what information they’re giving you. Doing the calculation correctly means the basic algebra, or the adding, subtracting, multiplying, etc. Occasionally you might have to draw something or count something. It’s the step where you get the answer. Everyone knows that the hard part is Step 2, figuring out how to solve the problem. Not only that, but all through school your Math teachers have reinforced that knowing how to solve the problem is the most important part, by giving you partial credit when you show your work. That’s why it’s natural that your mind wants to rush through reading the problem to get to the part where you figure it out. Especially under the pressure of taking the SAT and doing it timed. Once you’ve figured out how to solve it, it’s also natural that your mind wants to rush the calculation part in order to get to the next question. But when you’re rushing, you’re not paying full attention to each step as you’re doing it. And when you lose your focus, you’re much more likely to make a mistake. Let’s look at some sample math problems and see how this works. Here’s one that’s easy to mis-read. When the number x is multiplied by 5, the result is the same as when 5 is added to x. What is the value of 4x ? Let’s start by writing out the algebra. It’s not that hard. Did you notice what’s tricky? If you read the problem correctly, you noticed that they asked for the value of 4x. If you did, good job. Your focus was right on. Most people, though are used to solving for x, so it’s easy to miss. It’s easy to just go along like we usually do, until we get x on one side of the equation. If you do that, you get the answer 5/4. Then you might just automatically circle (C). If you do, you’d get it wrong. Notice how that very common mistake is one of the answer choices. The people who make the SAT do it on purpose. They know a lot of people won’t be paying close attention. They know that a lot of people will go right past 4x = 5, ignoring that they just got the correct answer (E) because they didn’t carefully read the problem before beginning their work. Now let’s look at a problem where it’s easy to mis-calculate. If 4a + 5b = b, which of the following must equal 8a + 8b ? For some of you reading this, the algebra here might be a little harder, mostly because it’s a little less obvious what to do. Notice once again that it’s one of the answer choices. They know a lot of people will do something like that, pick (D), and get it wrong. OK. Now you understand how easy it is to lose focus on a problem you know how to do and get it wrong anyway. Let’s go back to the 3 things you have to do in any math problem. That doesn’t mean re-read it. It just means to take a couple of seconds and satisfy yourself that you did. Then go on to figure out how to solve it. Again, that doesn’t mean to re-calculate it. It just means to take a couple of seconds and satisfy yourself that you did. What this does is force you to slow down on each step and put your full attention on it. It makes you focus. By doing that, you eliminate the vast majority of “careless mistakes” and get the higher score you deserve. 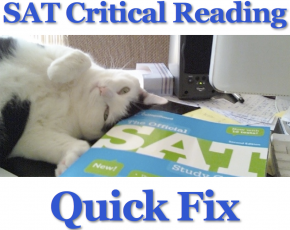 Your next step is to download this year’s Free Official SAT Practice Test from the College Board and practice what you’ve learned. You can also watch my recent student Jeremy talk about how learning to focus helped him raise his SAT score a lot. I am now about to take my SAT exams but am really scared. Can you help?? 1) Prepare as much as you can. If you feel like you’ve done as much as you can, then you can feel good about yourself no matter what your results are. 2) Know that you can take it several times. This takes pressure off any one time you take it. It’s really never your last chance. 3) If you can focus in on the test (another way to say this is put your full attention on the test questions) once it starts, the feeling of fear will lessen or even go away entirely. 4) If you feel the physical sensations that we associate with fear, stop for a moment and either take a few deep breaths or make yourself laugh. That will change your mood right away. Good luck! I hope you do really well. this is really nice. thanks jeff! You’re welcome! Thanks for the kind words. Let me know how it goes for you. And good luck! My main problem is that during the exam, I get “stuck” on average ~ 3 problems for the whole math section. I think I forget how to do them, but when I check my answers, I realize that I had just overlooked or had made a really unfocused or careless mistake. The same goes for my writing section; I always end up overlooking a flaw that is so obvious when I check my answers. I’m pretty sure that I don’t rush through my problems; I always take some time to check through my work and reread the question to see if I am missing anything, but it still slips my eye. The part where you ask if it could be because you’re not getting enough sleep is pretty funny. If it’s true, then of course it’s the reason, or at least part of the reason. When I was in school I never crammed for a test the night before, because if you stay up too late the night before you can’t do your best on the test. You need to get all of the information into your brain, but then you have to be able to get it out when you take the test, and that requires you to be well rested and focused. Unless the problems that you’re getting stuck on are the last ones in each section, you have to skip them once you realize that you’re stuck, go on to answer all of the other questions in the section, and come back to them at the end. When you’re stuck, it’s almost always because there’s something that you’re not seeing, and when you feel stuck, the part of the brain responsible for that shuts down. When you come back to that problem again and you don’t have to worry about all of the other questions because now you’ve answered them already, then you’re brain won’t be stuck any longer and you’ll be much more likely to see what you missed the first time. That was really helpful… Thanks for your tips.. I shall use them to my best…!! You’re welcome, Tarun! Good luck with everything!